The One Day of the Year by Alan Seymour is an intriguing dissection of the morality surrounding the commemoration days of war – in this instance, the infamously disastrous Gallipoli campaign in World War One, which saw the slaughter of hundreds of thousands of Anzac troops in the Ottoman Empire. Set in the surroundings of a 1960s Australian family home, the breadth of content covered by the piece is extremely admirable and very much still relatable today. Issues such as the glorification of war, patriotic propaganda, class restriction and parent-child relationships all combine to make a thoroughly thrilling, and surprisingly little known piece. This particular production consists of an almost entirely Australian trained cast, adding to the authenticity of the backgrounds and accents. The enigmatic ‘Alf’ (Mark Little) is a character demanding of much light and shade and varying emotions through the piece, and this portrayal was the standout of the night. Through the convincing patriotism, condemnation of his internationalist son and lunatic drunkenness, a wide array of skilled acting talent was demonstrated. Despite the seriousness of the subject matter on display, Little’s mastery of the role is such that comedy moments appear where they seem not even to be scripted. The entire cast dealt excellently with the transitions in mood that the piece has. The contrasts of the privileged ‘Jan’ (Adele Querol) with the rest of the very much proudly working class Cooke Family enhanced the confrontation scenes. ‘Dot’ and ‘Wacka’ (Fiona Press and Paul Haley respectively) bring much needed grounding to the surrounding conflicts, bringing a very believable struggling housewife and damaged war veteran to the table. They share a particularly moving scene, involving a monologue highlighting the atrocity of a single man’s experience of war. The chemistry between all the actors is so obviously strong, in fact. Dialogue flows very naturally and doesn’t at all feel rehearsed. The character of Hughie (James William Wright) completes the small cast of five, playing in many ways the audience surrogate of the piece – or in fact the challenger to your own preconceptions of war celebration, depending on your viewpoint. A fiercely moral part, a working class boy trying to better himself whilst falling foul of the hubris of intelligence, Wright captures the attention very well. Some explosive confrontations and at times transgressive moral judgements on his family members truly make you sit up and take notice. It’s part of the strength of the play that you won’t be sure to what extent you’re in support of this character. Despite the historical focus of the play, don’t be put off seeing this excellent piece for a lack of knowledge about the event. Everything you need to know is presented for you, including the refreshingly more accurate view about widely ignored murky past of celebrated hero Winston Churchill. Regardless, the issues are applicable to a modern day climate, which is hit home even more by the projections of war images onto the sides of the walls at climactic moments. The rest of the production makes great use of the cosy space provided by the Finborough Theatre, lending itself greatly to an intimate and up-close experience of some very talented actors. The One Day of the Year is part of ‘The Great War 100’ season at the Finborough Theatre, commemorating the centenary of an event whose ripples are still being felt today. If anyone is in the vicinity of the Finborough I can thoroughly recommend your time and money being spent on this production, for its limited run. You’ll come out feeling touched, enhanced and educated, and not at all like two hours have just passed. In a production commissioned by the Finborough Theatre as part of its GreatWar100 series to commemorate the centenary of the Gallipoli campaign, Defibrillator return to the Finborough Theatre with the first UK production in over fifty years of Alan Seymour’s iconic play The One Day of the Year, directed by Wayne Harrison, former Artistic Director of the Sydney Theatre Company, opening for a four week limited season on Tuesday, 19th May 2015. Is ANZAC Day just an excuse for “one long grog-up” or is it a day when Australians reflect on those who have paid the ultimate price? 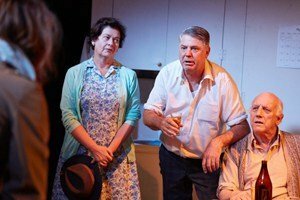 One of Australia’s most popular and favourite plays, The One Day of the Year explores the universal theme of father-son conflict against the background of the beery haze and the heady, nostalgic sentimentality of ANZAC Day – Australia’s equivalent of Remembrance Sunday – and a sacred cow among Australian annual celebrations. For war veterans like Alf and his friend Wacka, ANZAC Day is an opportunity to commemorate history and the forging of Australia’s national identity. The One Day of the Year generated huge controversy in Australia following its publication in 1960 with a policeman stationed at the stage door to ward off the angry public, while death threats were sent to the author. Last seen in the UK at the Theatre Royal Stratford East in 1961, this production rediscovers an Australian theatre classic.